In late September 2011, local reports indicated the presence of intense algal blooms along the Southern California coastline. 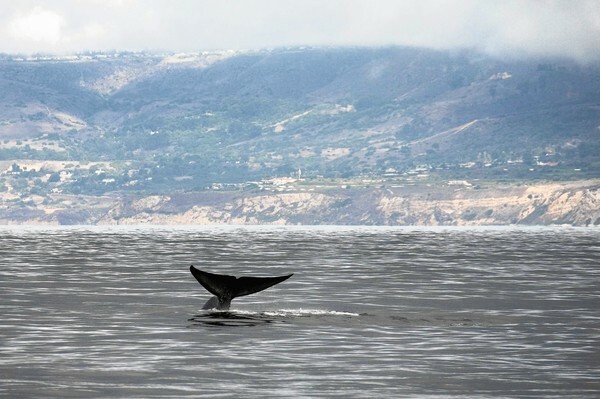 This was followed in early October by an unusual congregation of blue whales feeding near Los Angeles, including shipping lanes where the whales could be at severe risk. The continued presence of these whales indicated a readily available and concentrated food source of krill, small shrimp-like crustaceans. An examination of satellite data available through PO.DAAC provides information on the oceanographic conditions that existed then and how the conditions may have been conducive to intense algal blooms. Left - The yellow to red colors indicate high levels of chlorophyll (indication of phytoplankton biomass), extending well offshore as well as in narrow bands next to the coastline. Right – Note the colder waters next to the coast and extending southward from central California along the Santa Barbara coast into Santa Monica Bay, indicative of coastal upwelling. High levels of chlorophyll often occur in areas of coastal upwelling, where cold waters come to the surface during periods when winds blowing southward parallel to coast (not shown) cause the coastal surface waters to move offshore. The colder waters contain nutrients, which combined with available sunlight, prompt phytoplankton growth. The surface current vectors show velocity and direction obtained by coastal radar systems (http://www.sccoos.org/data/hfrnet/). The satellite data are available through the PO.DAAC State of the Ocean (SOTO) visualization tool. The chart below shows the density of one algal species measured from 5 piers (see map). Note the increased density at the Santa Monica, Newport, and Scripps piers beginning in September and lasting through mid-October. Harmful algae blooms are fast growing, dense populations of phytoplankton. The populations can be so dense that in the process of natural decay, oxygen may be depleted from the water which can then harm fish and marine invertebrates. Some forms of phytoplankton produce toxins that are transferred through the food web where they affect marine animals. Red tide is a common name for dense blooms of certain algal species that have red-brown pigments. 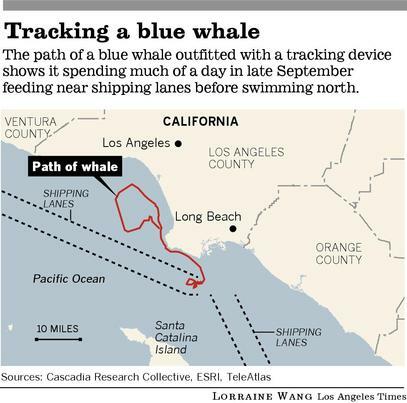 Endangered blue whales, because they increasingly feed near the ports of Los Angeles and Long Beach, are at risk of being hit and killed by the enormous ships heading to and from the complex.